Welcome to our acrostic quest! 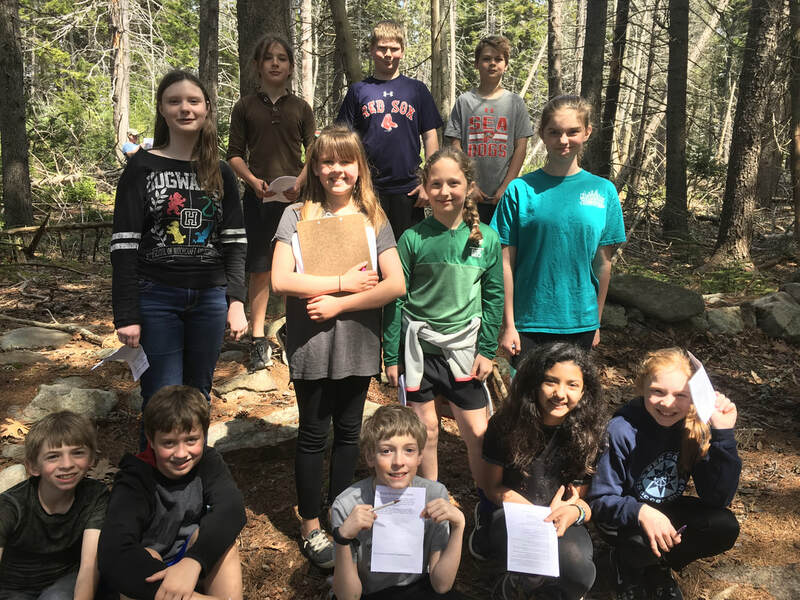 It was created in 2017-18 by the 5th and 6th grade class at South Bristol School. 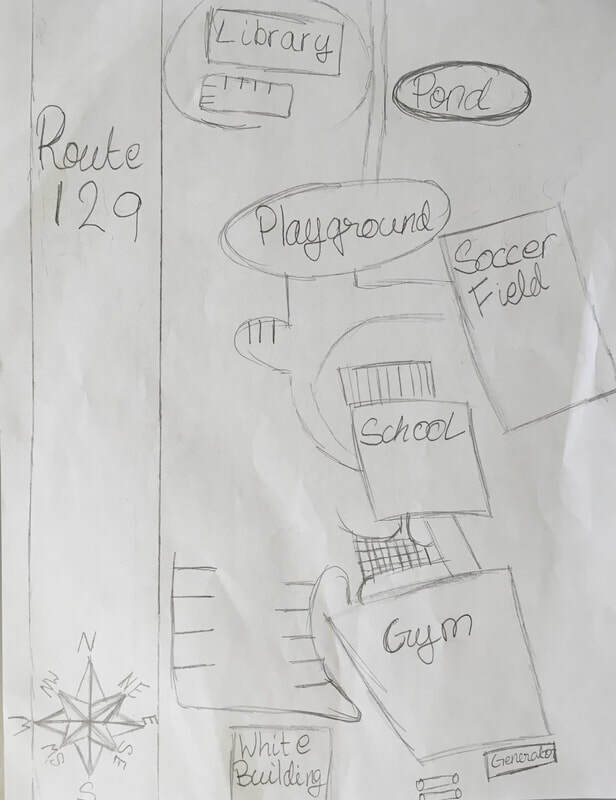 Please park at the school on Route 129 in South Bristol. Please respect the places that you visit on this quest. Have fun! This is the beginning of our South Bristol School (SBS) Quest. Head south to the brick walkway with names on them. I would like you to walk to the garden next to the gym doors. SBS has its very own Remembrance Garden, so take a careful peek. Quickly walk to the parking lot. Unfrozen after winter, the fruit trees that we planted in 2018 will begin to show buds. Even though you’re enjoying our trees, we ask you to go to the white building please. SBS's After School Care has been held here since 2016. They make many crafts, read, and eat snacks here. Instead of admiring our white building all day, take a left and walk around the school. So, as you come around you should walk to our generator. Then walk east to the stone wall and then go to the south. Head 150 ft. down the path to the huge boot-shaped stone that is part of the wall. Except don’t walk past it. Because you still have a while to go, listen to this history. European settlers came to Bristol in 1620. Settlers didn't come back to Bristol for 40 years, due to Native American attacks. The town used to be responsible for the poor and infirm. If you hop the wall then walk north, you will get to a thin white rope hanging down. To get closer to the box turn east, down the trail deeper into the woods. We assume you see the field to your left. Continue to the southeast corner. Left and keep going straight down the path for about 250 feet. Look on the left hand side for a short debris-covered plateau of flat rocks among trees. People had a lot of different jobs in the olden days of South Bristol. Usually they would either be farmers, fishermen, or ice harvesters. They were very big on farming sheep, not so much on food. Year-round residents of South Bristol would harvest ice during the winter. On warmer days, they would fish for lobster and we still do that today. Unbeatable boats have been built here for generations. The latitude and longitude at the “Gut” bridge is 43° 51' 43'' N, 69° 33' 35'' W.
Our town is a peninsula. To the east is John’s Bay. To the west is Damariscotta River. The town of Bristol was established in 1765. Here most of Bristol was happy. The politics in the town of Bristol got really frustrating. Even the way they let the “Gut” bridge decay was aggravating. Schools didn’t get enough money. The economy was boatbuilding and fishing, not farming. Even talking about becoming independent and separating. Unified against being part of the large town of Bristol. 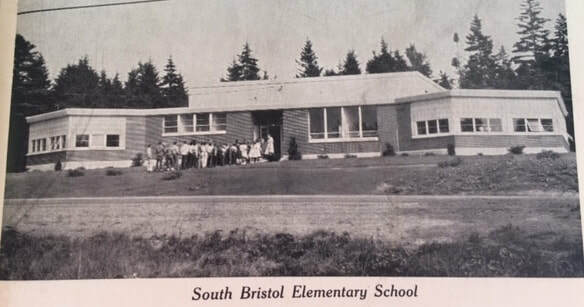 Established the town of South Bristol in 1915. The town’s centennial was celebrated during the summer of 2015. Even a 5k road race, a kids race, vendors, and many other things. So now it's time to get back on your feet and onto the long “road” ahead. Until you get to the big white birch tree with a long diagonal slash on your left. This is your next checkpoint; turn left off the trail to a smelly pipe. Look/sniff carefully! Because it doesn’t smell too good. Right now follow an old hard-to-find road/path southwest toward the playground. If you walk past a tiny pond and see tall rocks on the left, you are in the right place. So, walk to the old septic tank covered with dirt; then turn right; walk behind the fence. The pre-2007 playground equipment is now over at Pemaquid Campground. On your way north toward the pond look for a land marker that will be orange. Land markers are stakes in the ground that mark the corner of someone’s property. Many bad things are in the dugout, so don’t take a peek. At this pond you can go ice skating in the winter. Right in the pond, there is a huge tire that you can see. Instead of going on, read these facts about the school and its surroundings. Nowadays, our school teaches 64 students. Eighty students attended our school when it opened in 1962. Roosevelt (S Rd.) was one of the five schools around before then. Some others were Gladstone School (Clarks Cove Rd.) and SB High School (Island). After part of the road was demolished, the school was built in its path. Even outdoor basketball hoops and chainlink fence (2017), and Gaga Ball pit (2018). Zero quarries exist in South Bristol now; there was one behind the school long ago. East of the school, the stone quarry was dug into a hill near John’s Bay. Stones would then be shipped all over to build things. Today, buildings can still be made of stone, but the rocks often aren’t from Maine. When Tuttle’s Pond was built, it was owned by Afton Farrin. Eventually John Sewall gifted it to the Town of South Bristol in the 1950s or 60s. Here, you continue past the pond to the Rutherford Library. On the path, keep going straight north. Please go till you see a parking lot with a building near it. Excitedly go into the library if you wish or walk to the Library Park Preserve kiosk. You will go counter clockwise around the library. Oh, there’s a huge hill; run down it! Understood. You will probably not do that. Enjoy taking the stone stairs back up to the parking lot. Now go back the way you came. Just follow the path back toward South Bristol School. You may want to look for a tree. This is not a regular tree… it fell down and now contains treasure! Is a large fallen tree running parallel to the road. See if you can find our secret under the roots. Everyone walk back to the school entrance. Super good job on finding your way back! Thanks for coming on our school’s quest!